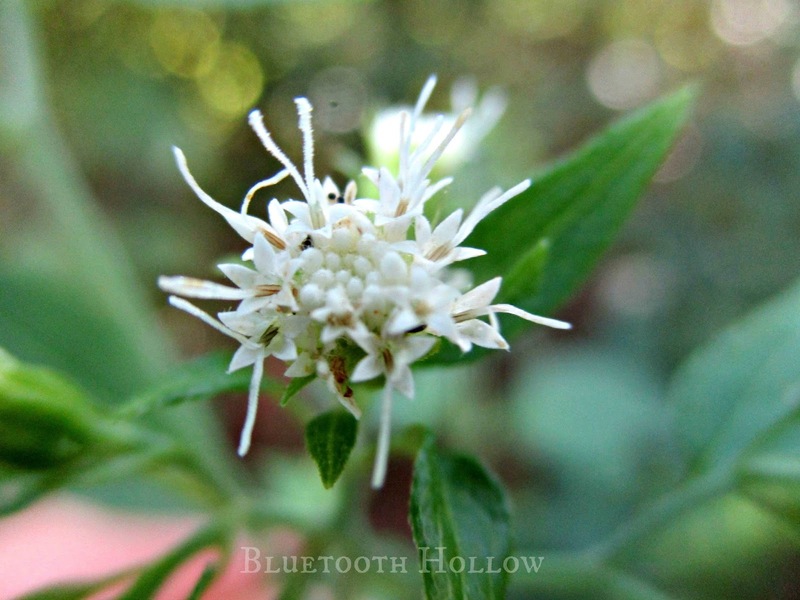 White flowers come in many shapes and sizes as the growing season comes to a close. One of the latest bloomers is White Snakeroot, filling the forest edges and understory with its bright white glow. Snakeroot is a common plant in the eastern United States and Canada, enjoying the lightly shaded zones along woodland margins and road sides. Its soil preferences range from moist to dry, with a particular affinity for loam and loamy clay substrates. It averages 2-4 feet tall, although I have seen it grow well over 5. 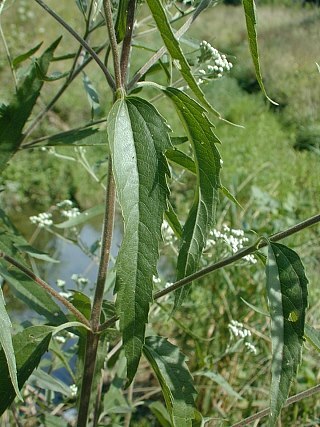 The thin, usually hairless leaves are oppositely arranged, and can be ovate or heart-shaped, with palmate leaf venation with sharply serrated edges. The bright white flowers are arranged in a rounded or flat-topped corymb, spanning 2-6 inches across. Individual blooms lack ray flowers, but the disk flowers can number from 10-30 on each flower head, and are each composed of 5-lobed corollas with brilliant white styles. 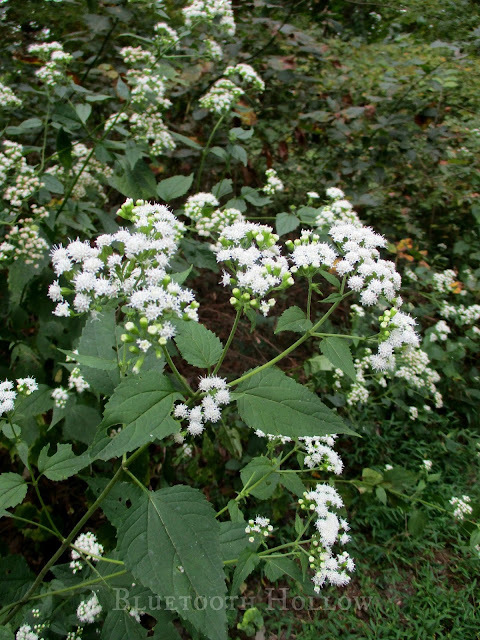 White Snakeroot can be found blooming for a six week stretch between July and October. While it mostly colonizes by spreading rhizomes, its fluffy seeds are wind-dispersed, whisking them away to new destinations. 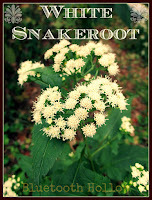 Snakeroot's Latin name is Ageratina altissima. 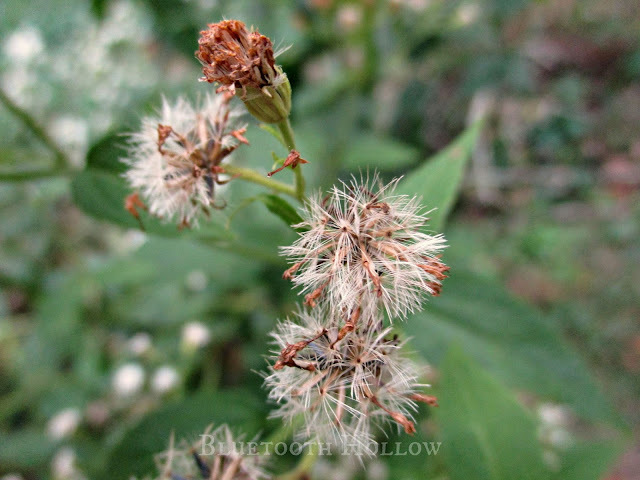 Ageratina stems from the Greek word ageratos, a botanical word describing flowers that kept their color for a prolonged period of time, with the ina suffix meaning "small." 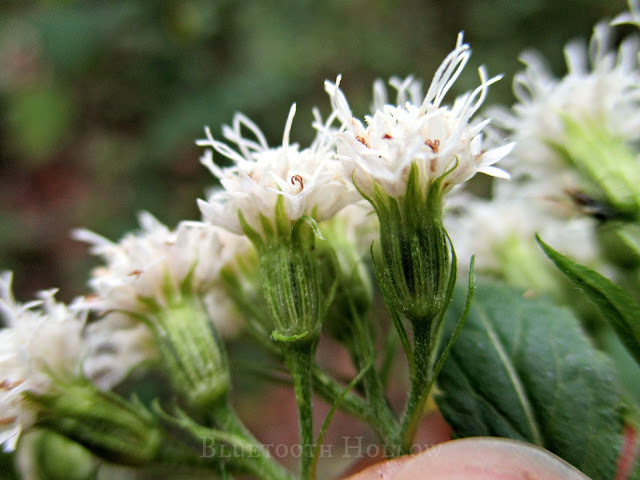 Its previous Latin name was Eupatorium rugosum, but the plant was recently assigned to its new genus when botanists discovered its chromosome count differed from other members in its family. 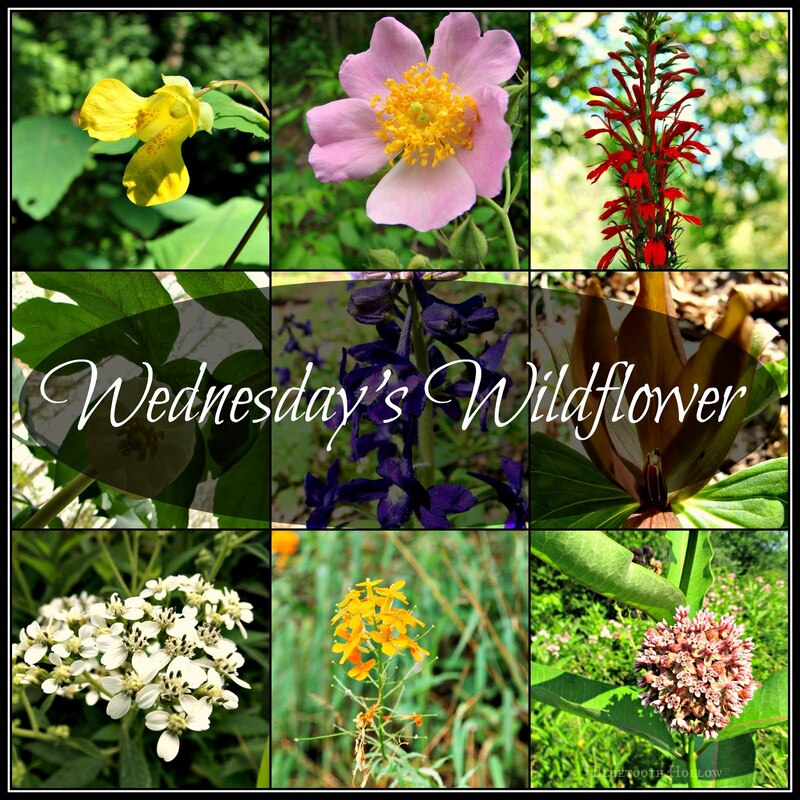 Other common names include Deerweed, Deerwort, Hemp-Agrimony, Fall Poison, Indian Sanicle and White Top. 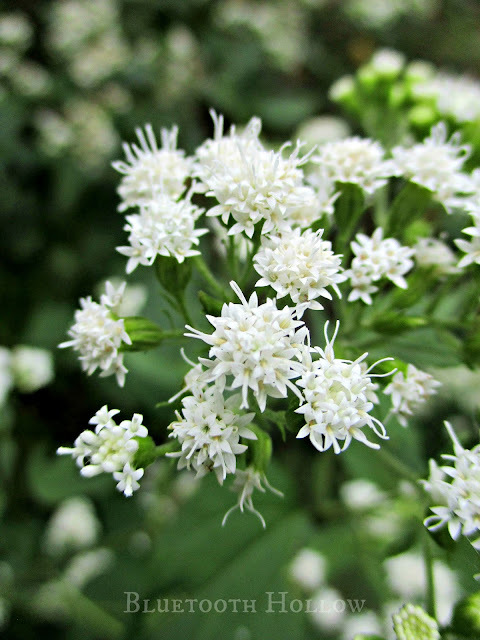 White Snakeroot has a handful of look-alikes that can sometimes cause confusion, especially since they are all late-season bloomers. 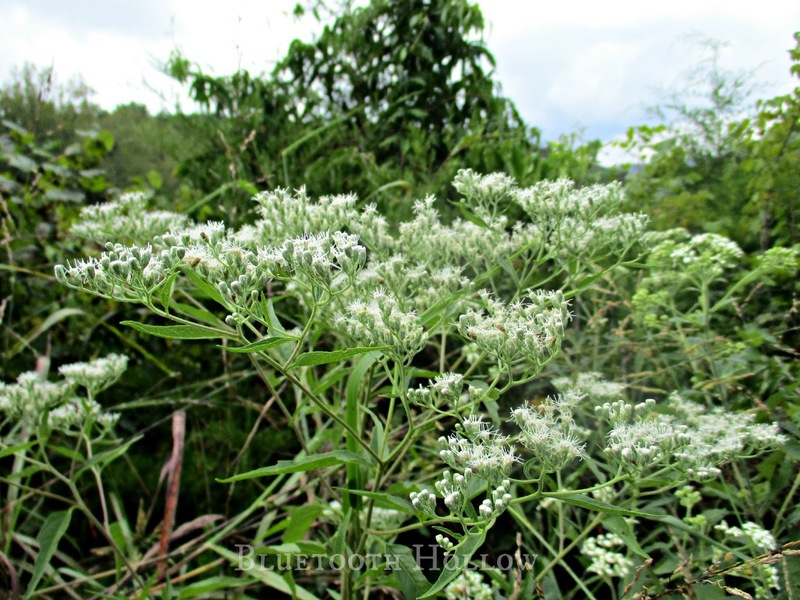 One of them is Common Boneset, or Eupatorium perfoliatum. 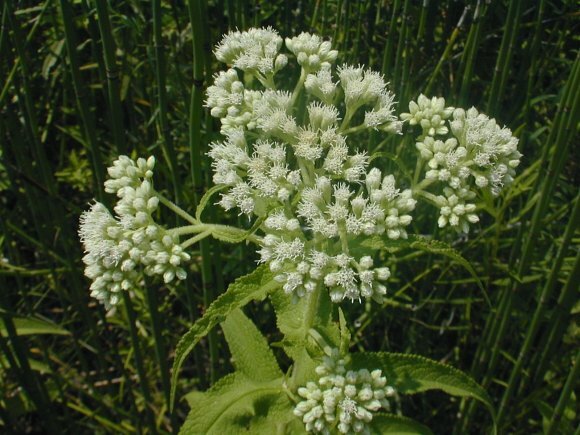 Boneset is more of a wetland plant, preferring low, wet woods, fields, ditches, stream banks and prairies. 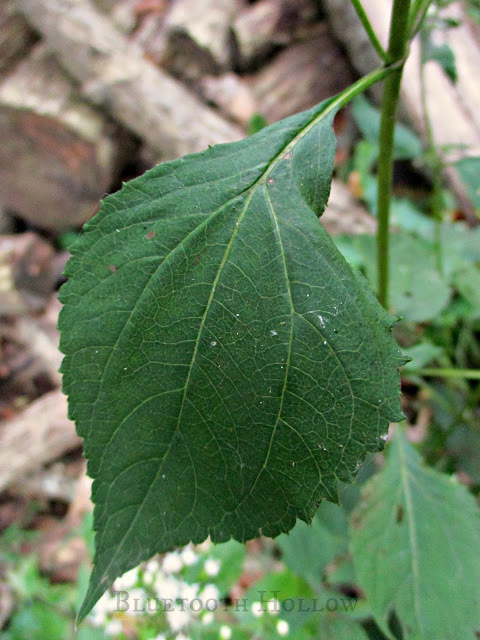 The stem is covered in long, white hairs, and the opposite, lance-shaped leaves have clasping bases with a network of conspicuous veins. Another close cousin is Late-Flowering Thoroughwort, or Eupatorium serotinum. 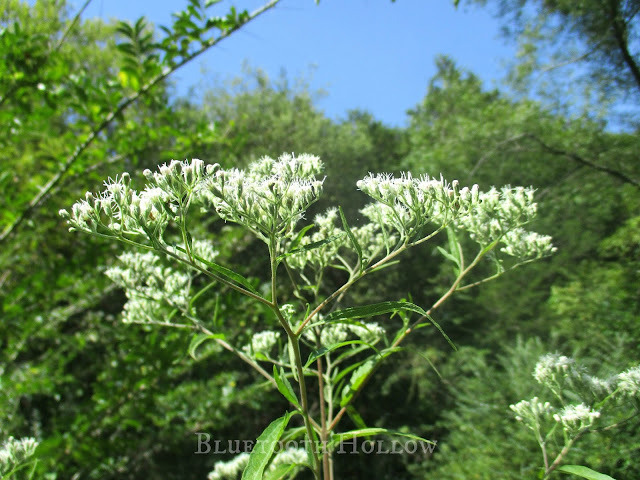 It also goes by Late Boneset, causing further confusion. 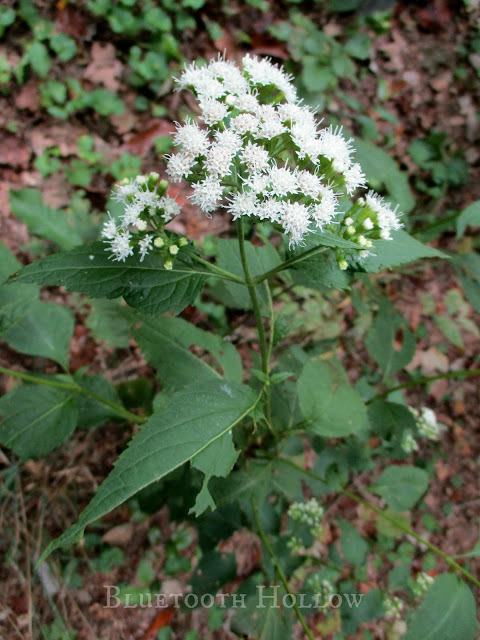 Its flower corymb is decidedly more flat-topped, and it prefers sunnier locales than Snakeroot. 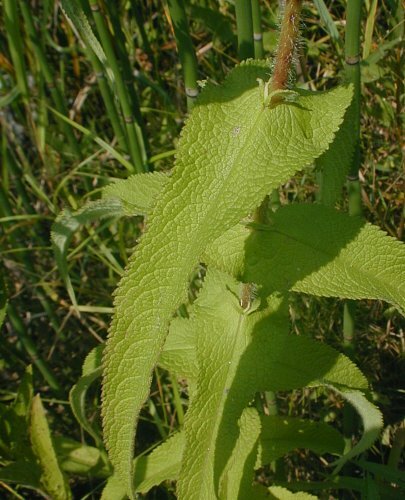 E. serotinum's leaves are also longer and narrower. Most other Thoroughwort species can be told apart by their leaf shapes as well. White Snakeroot gets its name from the mistaken belief that the roots could be used to treat snakebites. It's actually quite toxic, containing a complex alcohol known as tremetol, in addition to several glycosides. 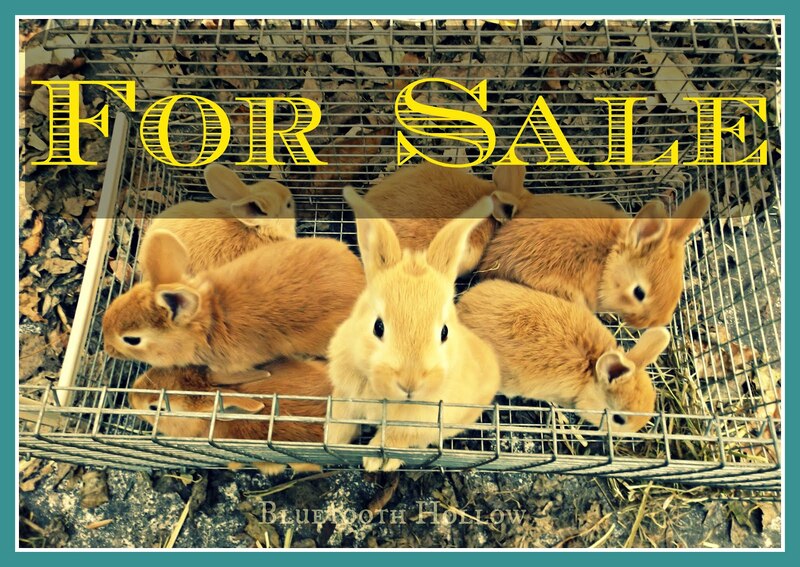 It is toxic not only to humans, but also to livestock, creating a fatal condition in cattle known as "staggers." These toxins can even be passed to humans via cow's milk, which was historically known as "milk sickness," - a condition common from the Colonial period to the early 19th Century. Milk Sickness was the cause of death for Abraham Lincoln's mother. 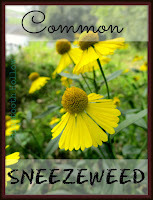 Despite all of this, it has had numerous medicinal uses over the centuries. The root acts as a stimulant, diaphoretic, diuretic and tonic. 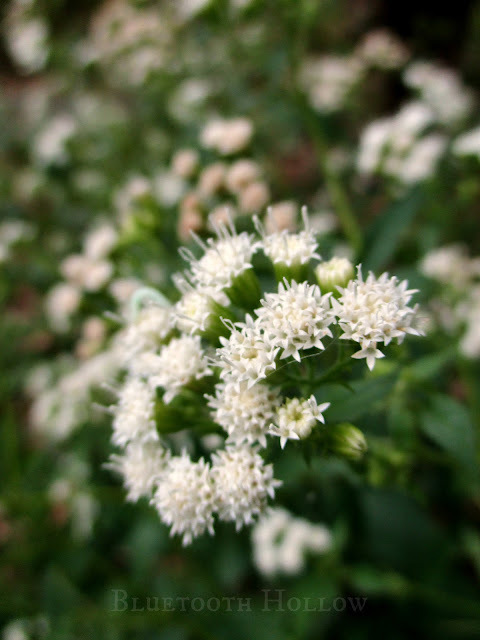 It was used in the treatment of diarrhea and urinary tract disease. It was also used in an herbal bath to induce sweating, and an infusion or decoction was used to treat an inflamed uterus. The root was even chewed and held in the mouth to treat a toothache. 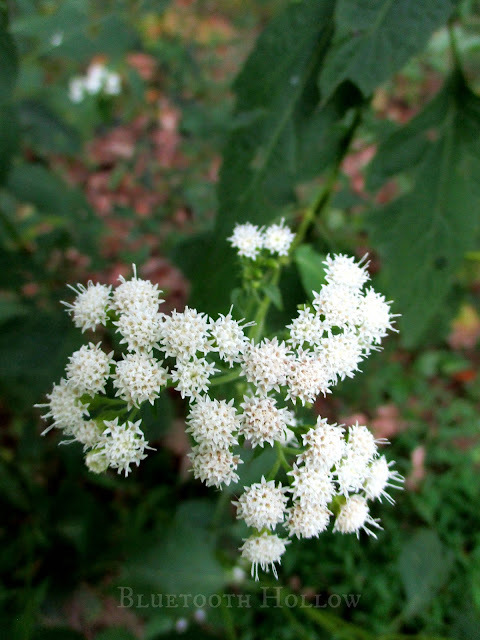 Its toxic foliage makes it pretty unpalatable to wild animals, but the blooms are a crucial source of food for pollinators in Autumn. 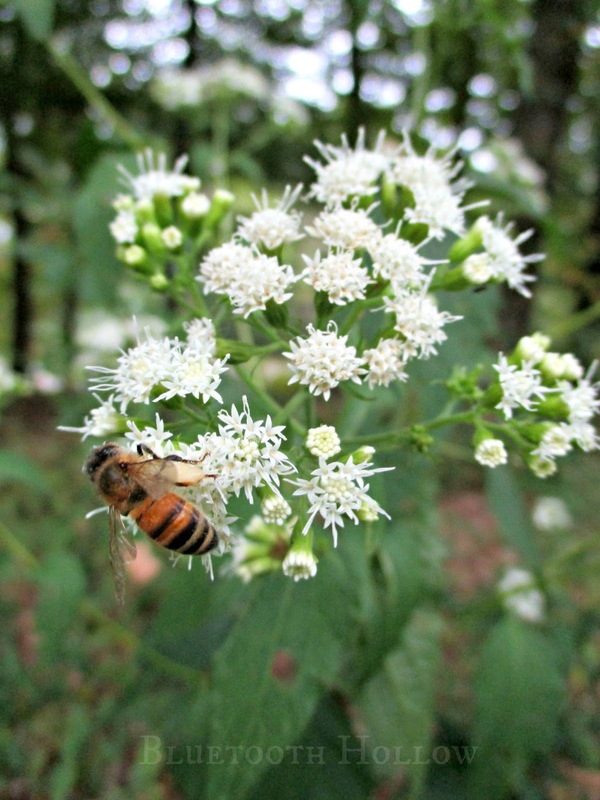 Bees, both native and honeybees, rely on Snakeroot for nectar and pollen. A host of other beneficial insects can be seen visiting Snakeroot as well, like flies, wasps, moths and butterflies. 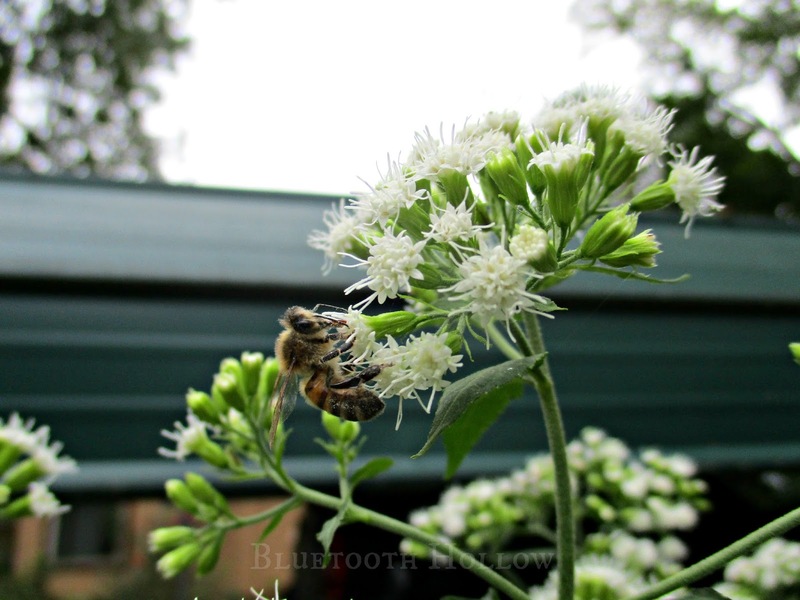 Snakeroot can also make a deer-proof addition to your landscaping, lighting up shady areas in the fall and providing a life line for pollinators before the winter chill. 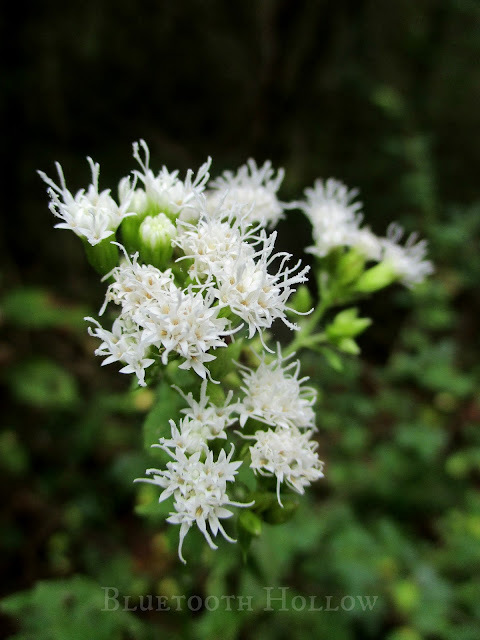 The snowy blooms of White Snakeroot are often one of the last standing as our region makes the fitful transition from warm to cold. 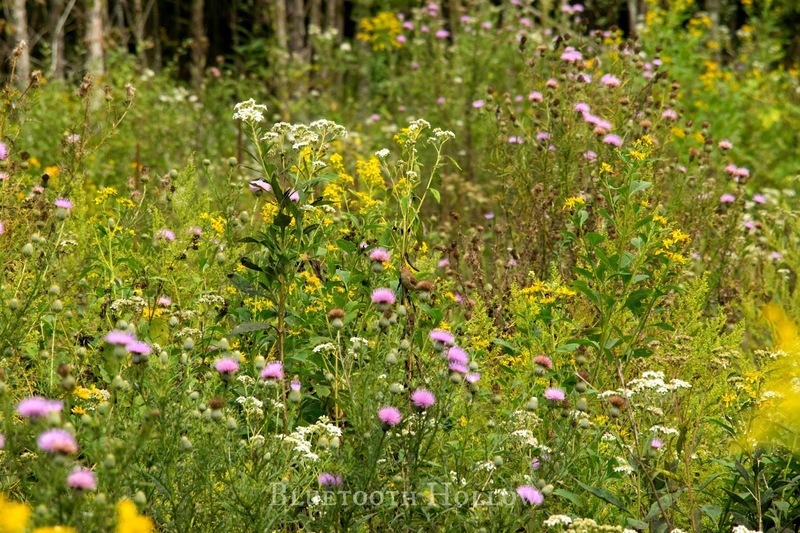 Its flowers remain as the woodland canvas transforms and shifts all around it in a colorful succession of green, brown, gold and red. Autumn is here, my friends! 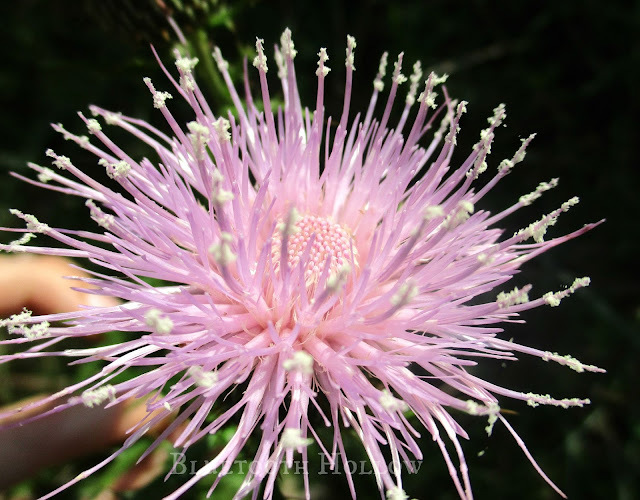 Click here to read about last week's wildflower, Field Thistle. 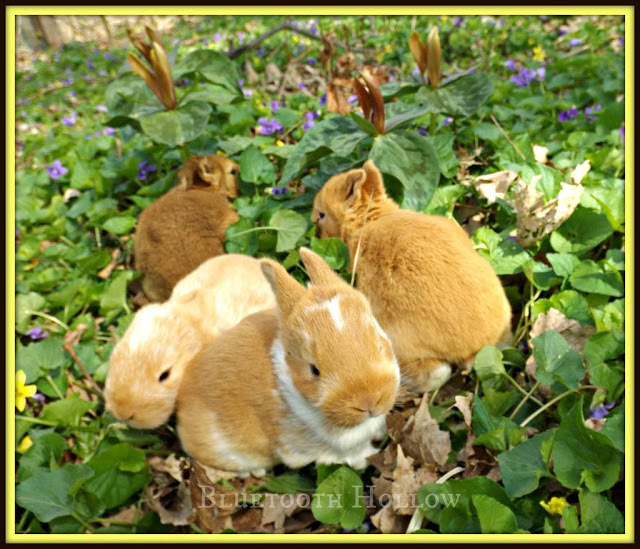 The Friends of the Wildflower Garden Inc.
Acer and her daughter Sumac kindled their litters today! Acer, as always, safely delivered 6 lovely reds, sired by our home-bred sire, Big Boy. Sumac obviously inherited Acer's mothering skills, and built a perfect nest in the nest box and delivered 9 gorgeous kits. Hers were sired by her father, Colbert, and are 1/4 New Zealand Red and 3/4 Creme d'Argent - the second generation in my back-crossing project. 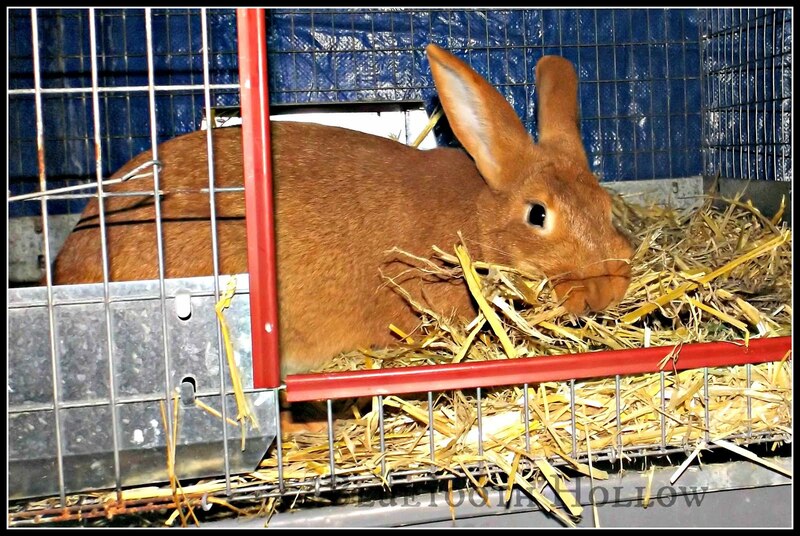 Good mothering abilities are definitely top priority in my rabbitry, and I am thrilled to see Sumac follow in her mother's footsteps. 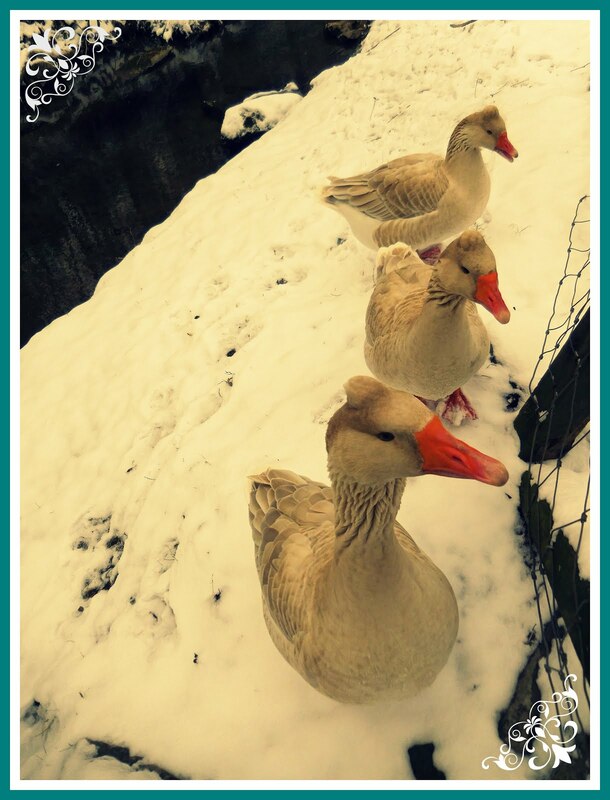 I'm eager to see them grow! I'll be breeding Cardamom's replacement, Allspice sometime in the next few weeks. Feels good to have things up and running again! We don't tend to think of plants as prey items, but they are, essentially. They are at the mercy of everything from insects to ungulates to us, tearing them limb from limb and munching on their delicate parts. Just like animal prey, plants have had to come up with ways to "fight back." 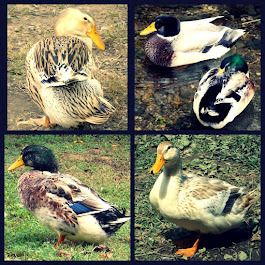 Some produce toxins to make their bodies unpalatable to herbivores, while others have developed irritating oils or hairs. Thistles, of course, arm themselves with prickles. They are members of the broad-reaching and distinguished Aster family, or Asteraceae, organized into two genera: Carduus and Cirsium. At least 60 species of thistle can be found in North America, with several of them having been introduced, primarily from Europe. 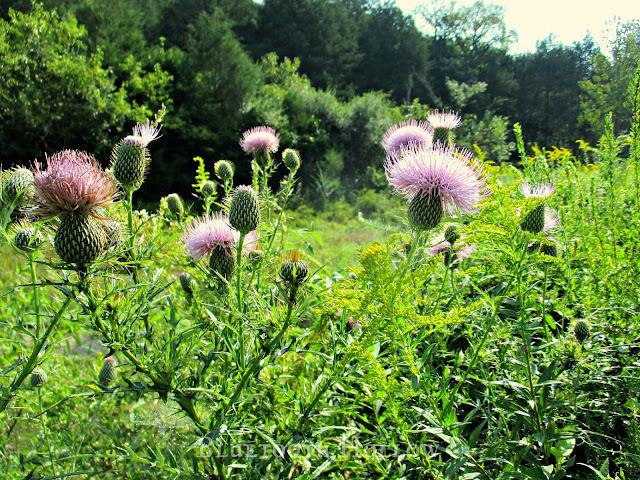 One of our native thistles is the Field Thistle, and its pale purple blooms float like clouds amidst a sea of yellow and white. 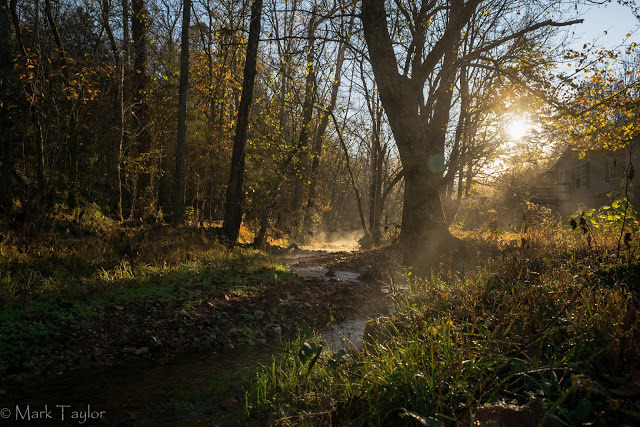 Found across much of the eastern United States, it likes sunny locations with mesic soil: abandoned fields, dry prairies, limestone glades, roadsides, powerline right-of-ways and moist meadows adjacent to rivers. 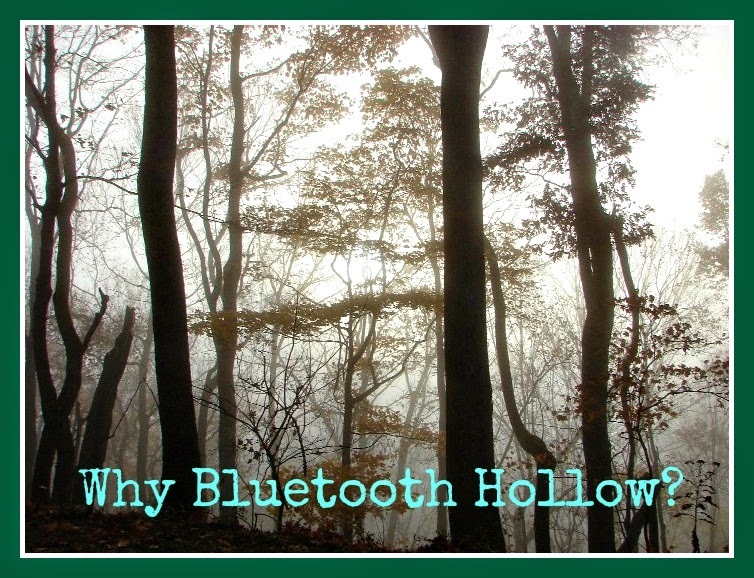 It occurs most abundantly in recently disturbed habitats. It is a biennial (completing its life cycle in two years) or short lived perennial, typically growing from 3 to 7 feet tall. It has a hairy stem, and numerous leaves that are divided into deep, spiny lobes. 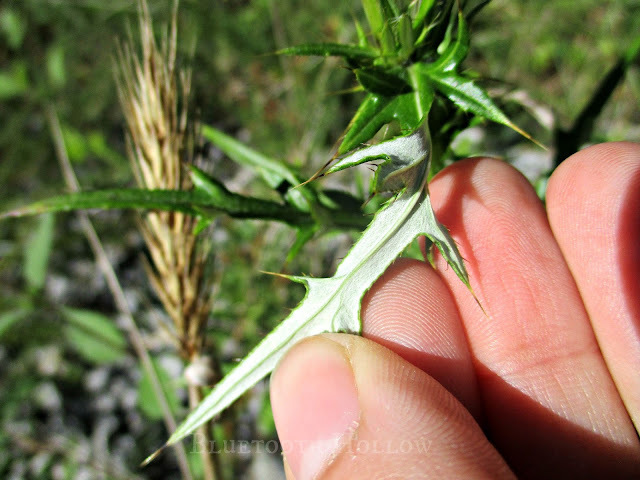 The undersides of the leaves are pale white, distinguishing them from similar thistle species. Plants have few to several flower heads measuring 2 inches across, purplish-pink in color. The overlapping bracts under the flowers are known as phyllaries, and are striped with light green central veins and tipped with thin, golden spines. 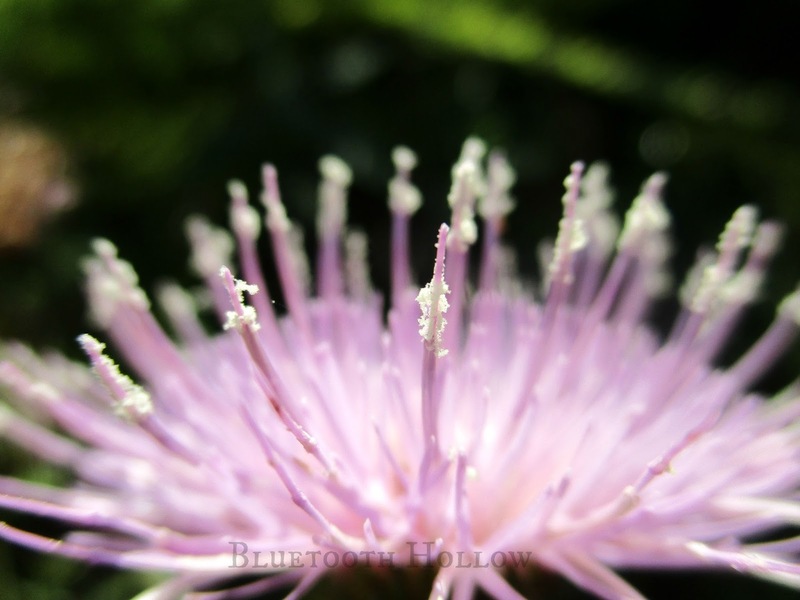 Field Thistles begin their bloom in late summer and continue into October. They are also known by the names Pasture Thistle and Bicolor Thistle. 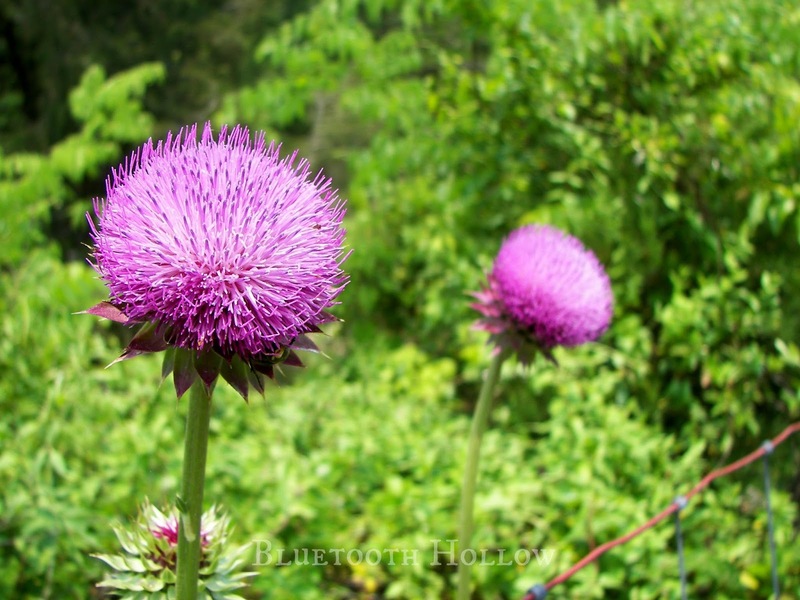 Their Latin name is Cirsium discolor. 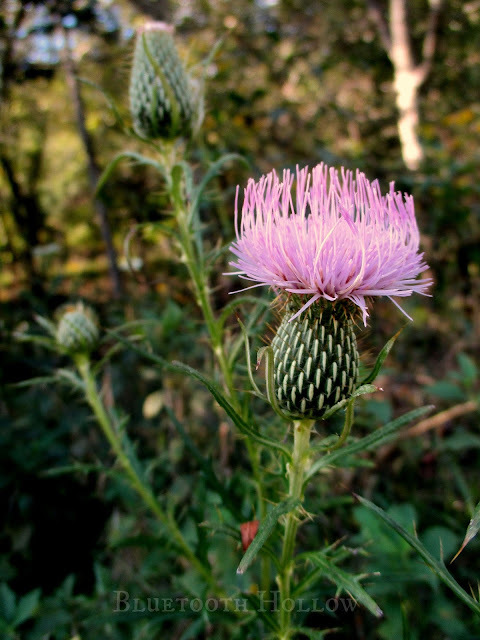 The genus, Cirsium, comes from the word circos, meaning "swollen vein," which is a malady thistles were once thought to cure. Discolor simply means "two different colors," in reference to its two-toned leaves. A similar species that can cause confusion is the Bull Thistle (Cirsium vulgare), a plant introduced from Europe and naturalized across our entire continent, often making quite a pest of itself. 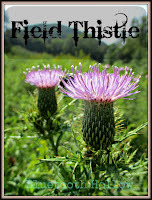 It has the same formidable defenses as the Field Thistle, but there are some subtle differences. 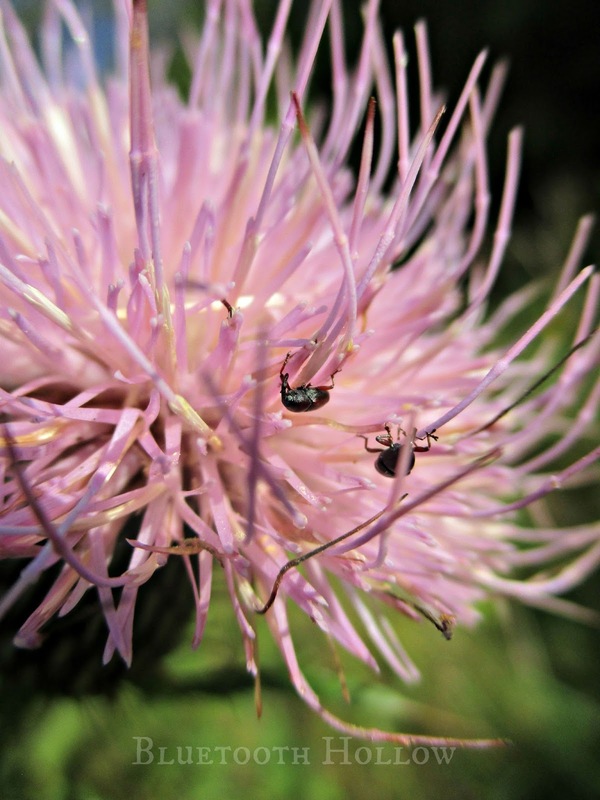 Bull Thistle flowers are a darker purple, and the phyllaries lack the pale central vein. 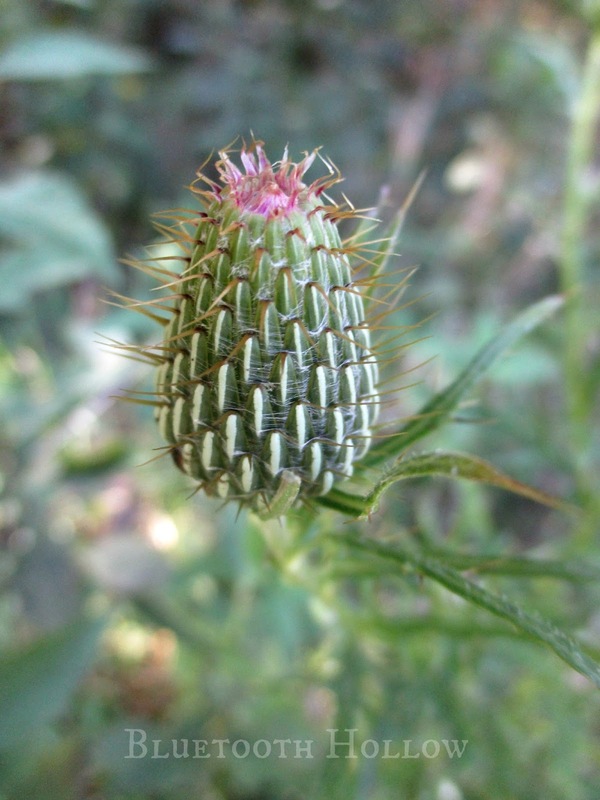 The spines that cover the bracts are much coarser and more numerous than those of the Field Thistle. They are also far more invasive. 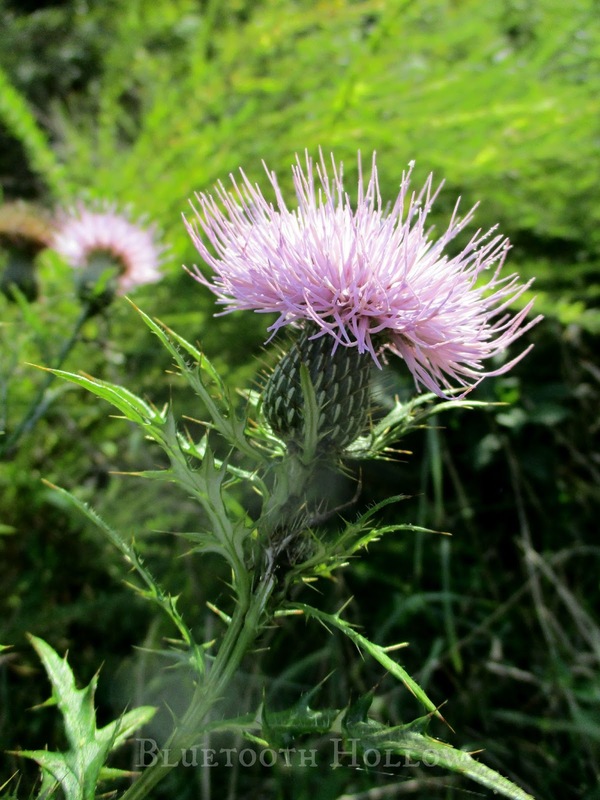 The Bull Thistle is thought to be responsible for the famous Scottish legend, ultimately leading to its veneration as Scotland's official symbol. As the story goes, an invading Norse army was attempting to sneak into a Scottish army encampment, when one barefoot Norseman happened to step on a thistle and cry out in pain, alerting the Scottish army to their presence and giving them victory over the invaders. 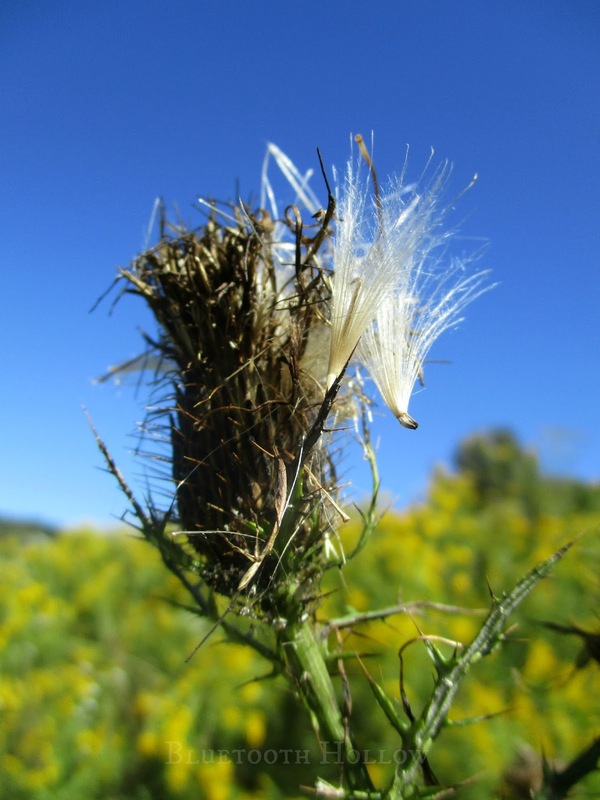 The type of thistle that pricked the Norseman's foot has been a subject of fierce debate for centuries, but Cirsium vulgare would have been the most likely culprit for that location and time period. Despite the thistle's formidable defenses, the plant is considered a fine edible. 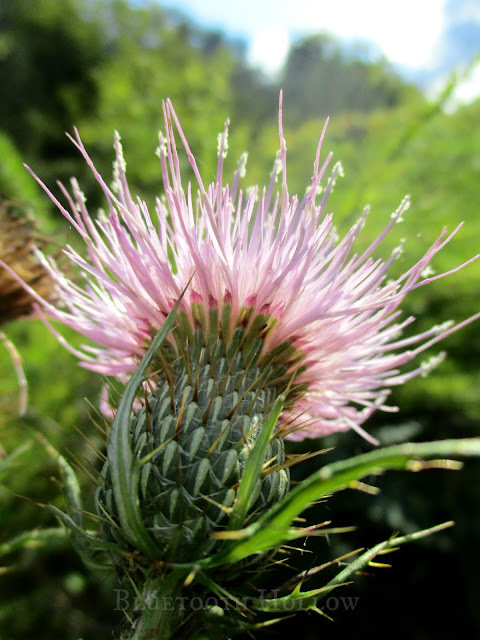 In fact, all true thistles (in the genera Cirsium and Carduus) are edible, though their palatability does vary between species. The leaves can be eaten, but of course require the snipping off of spines, which can be a little too labor intensive for some, but are said to be good raw or cooked. The roots can be harvested and eaten in mature plants, just be aware that they are high in the starch inulin, which we cannot digest - so they may have a bit of a, er - windy effect. The tastiest part of the plant is said to be the inner core of the young stalks from two-year-old plants. Harvesting, of course, takes a little care. Thick gloves are necessary, and you might wish to bring along newspaper to wrap the plants in once you've cut them (unless you decide to disarm them in the field). Simply take a sharp knife, pruning shears or even a shovel blade and cut the plant just above the basal leaves. 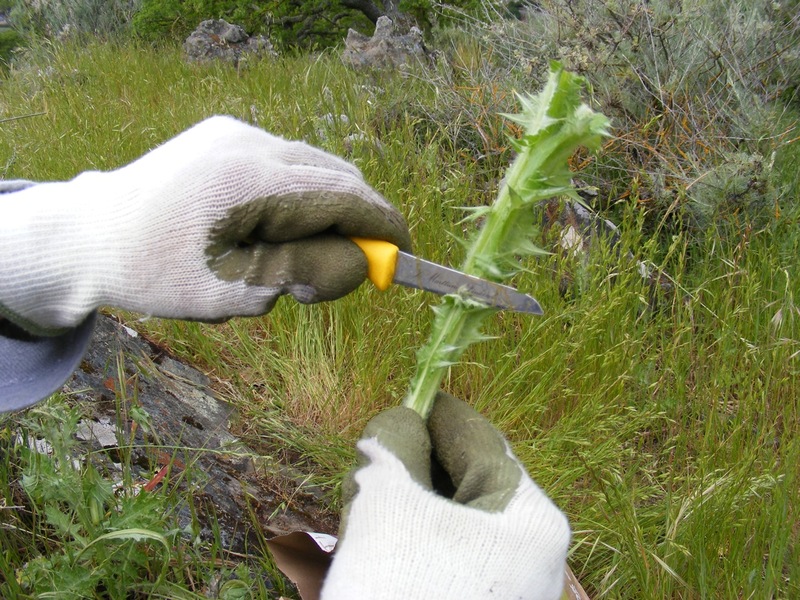 Holding it in a gloved hand, you can then snip off the spiny leaves with sharp scissors or shave them off with a sharp knife. To get to the tender core, peel the fibrous stalk until you start to see white. An alternative is simply to roast it whole and then squeeze out the cooked core. Younger stalks (before flowering) can be eaten raw as a salad green, and older stalks are great steamed or boiled and served with butter. The seeds can be eaten, but some sources state that they can contain toxic alkaloids, so please use caution. You can also extract oil from them - 12 pounds of seed will yield 3 pounds of oil suitable for cooking or lamp oil. 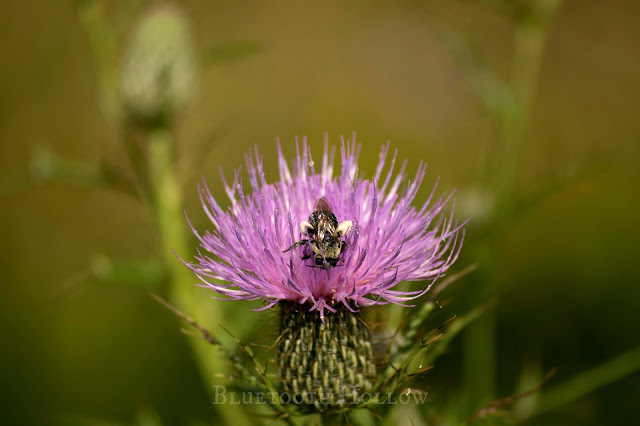 The thistle they are harvesting is Cirsium horridulum, or Yellow Thistle - a common weed in overgrazed pastures that is one of the better eating thistle species. 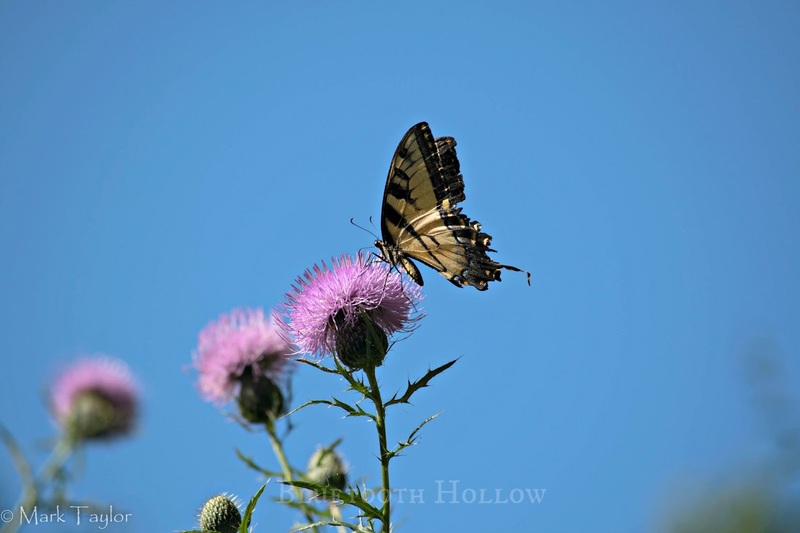 Thistles are useful for much more than just food. Older stalks are very fibrous, and can be used as cordage or even paper. 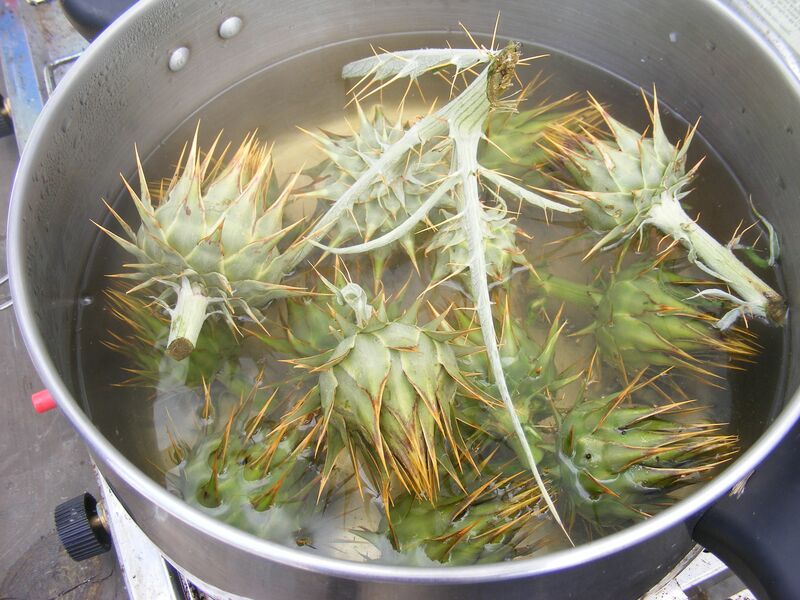 You can extract the fibers by soaking the plants in water for several days. 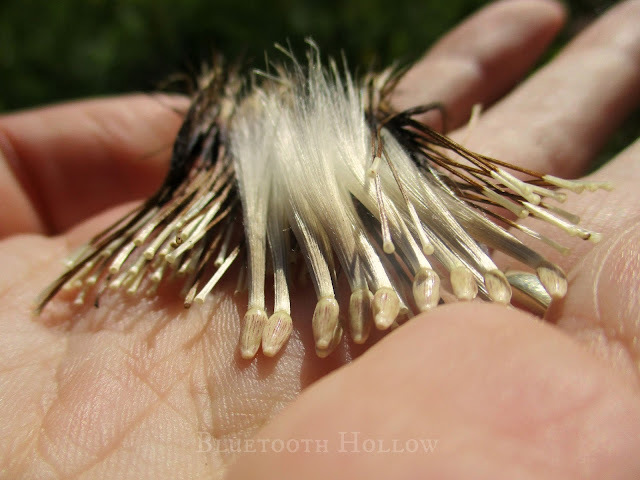 The Seminole Indians made blowgun darts out of thistle spines, and the seed down was used as guides for the darts. 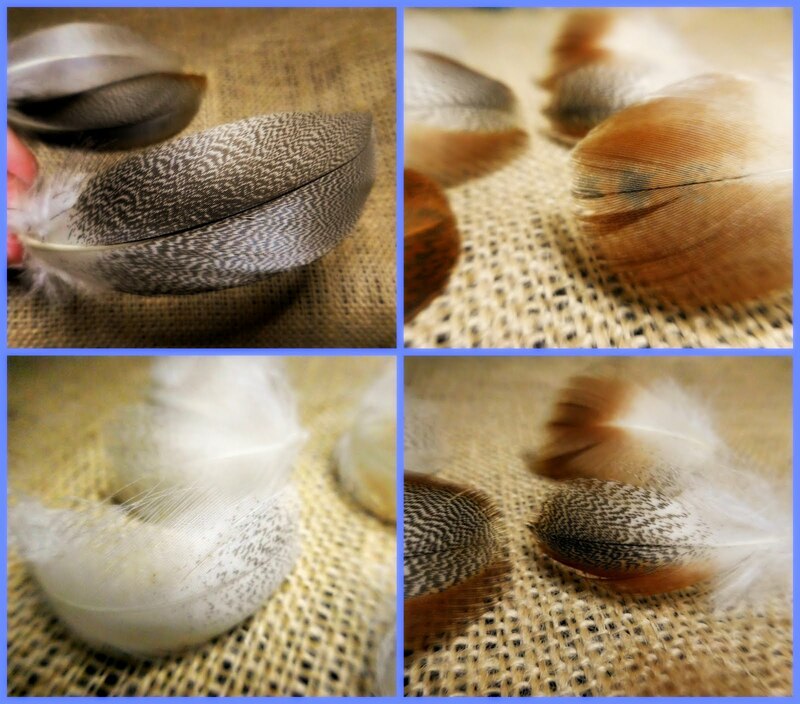 Dry seed fluff also makes great tinder for starting fires, easily lit by a spark from flint. 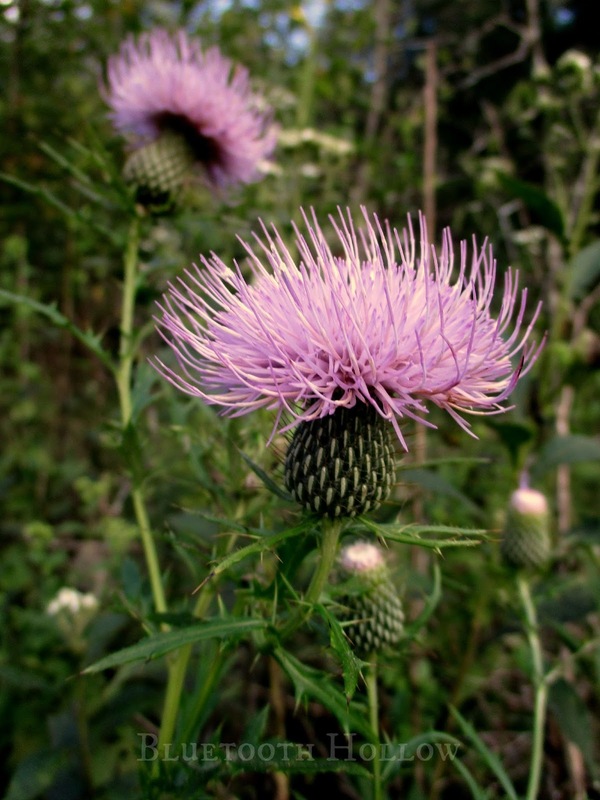 Thistles have also been an important source of healing medicine throughout our history. 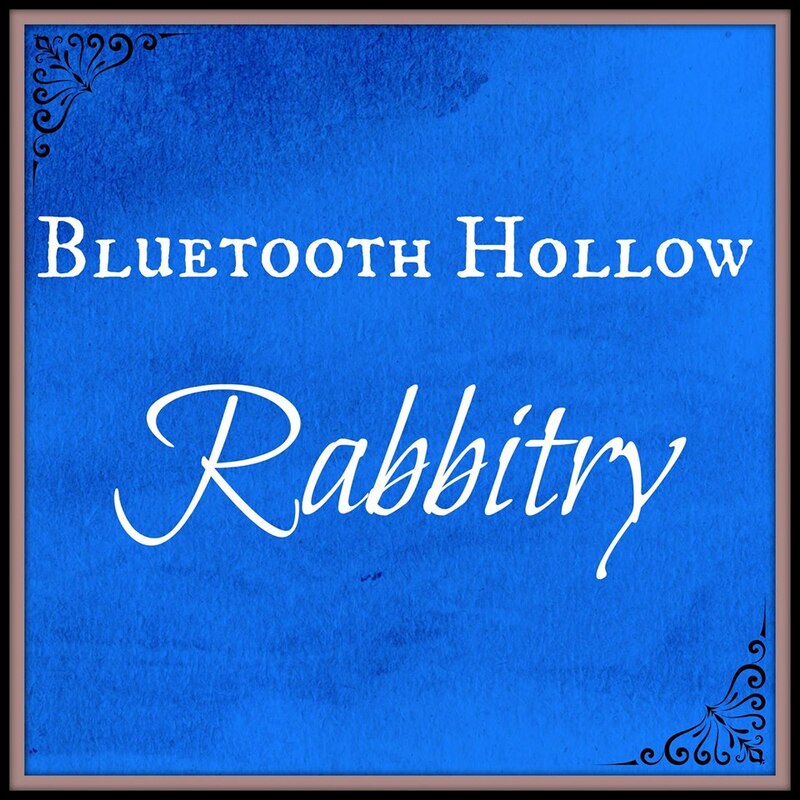 The roots were used in a poultice to treat a sore jaw. A warm infusion of the whole plant was used in the treatment of rheumatic joints. 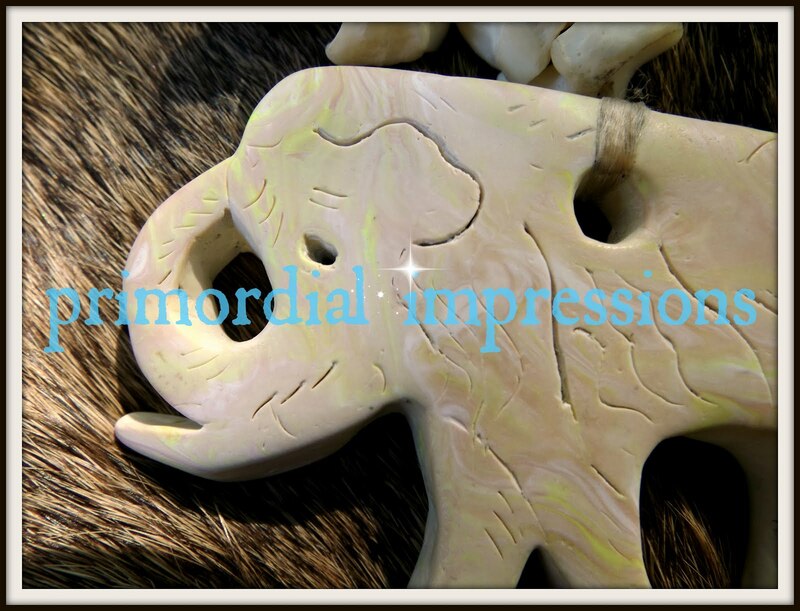 A whole plant decoction was used both internally and externally to treat bleeding hemorrhoids. Even though its defenses are useful against most herbivores, sometimes goats or burros will make a meal out of them. 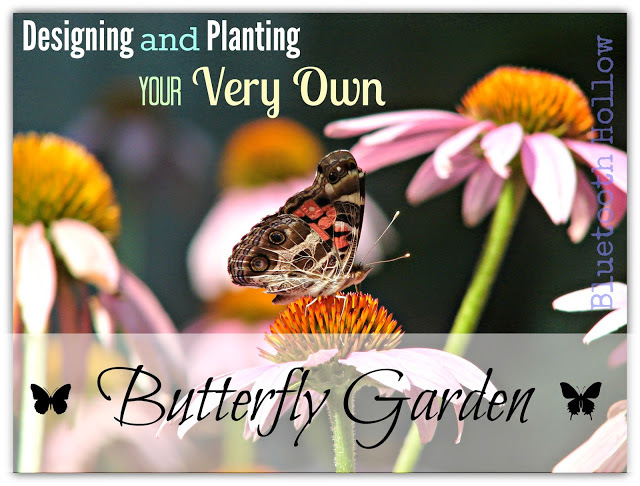 The foliage also provides food and shelter for several species of butterfly caterpillar, such as the Painted Lady. 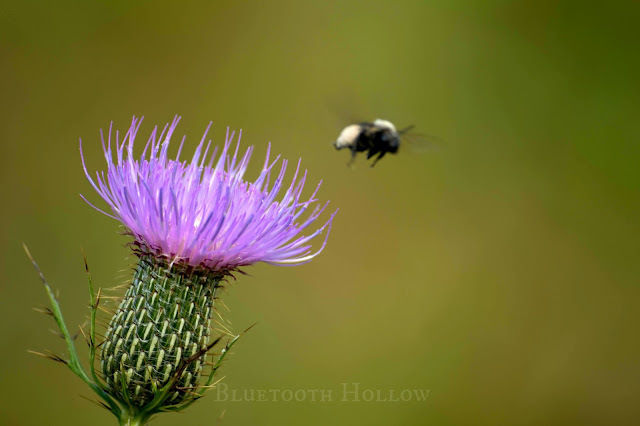 Native bees like Bumble Bees, Digger Bees and Leaf-Cutter bees rely on the Field thistle for nectar before the cold sets in. 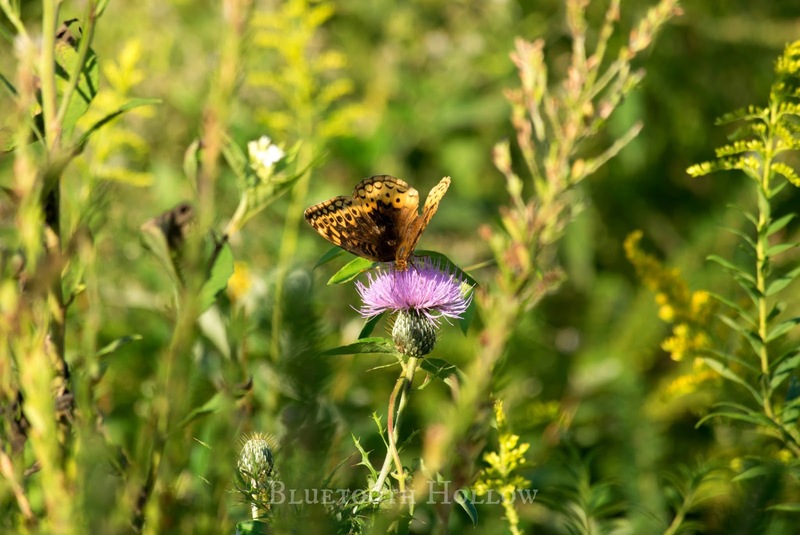 Many species of butterfly, especially Great Spangled Fritillaries, flock to the fluffy blooms to feed. 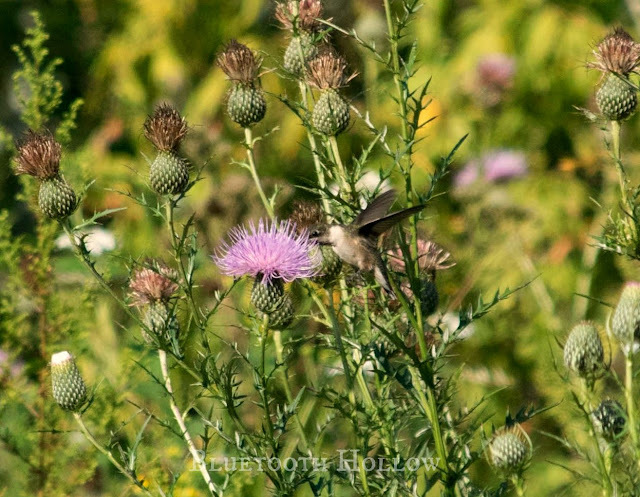 Ruby-Throated Hummingbirds enjoy thistle flowers, too. Thistle seed is a major fall and winter food source for the American Goldfinch, as well as Purple Finches, Pine Siskins, Indigo Buntings and Carolina Chickadees. 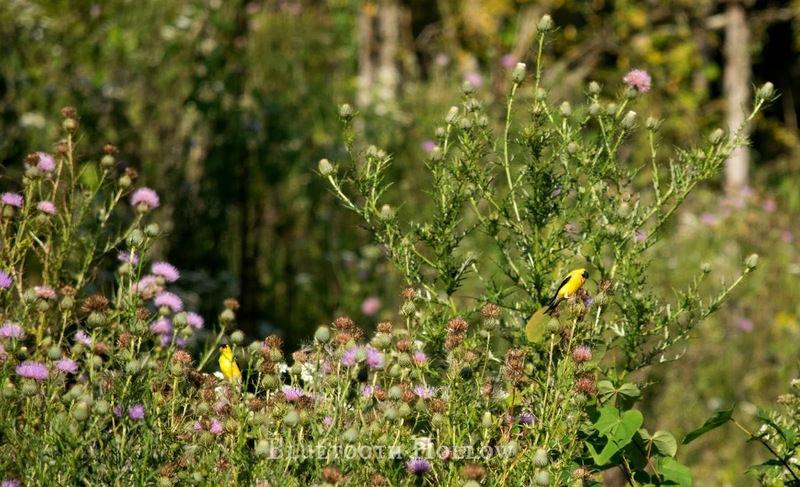 Goldfinches and thistles were made to compliment one another! Goldfinches love their thistles so much, they even use the seed down to line their nests with, once they've eaten their fill of seeds, of course. The prickly Field Thistle may not be the most inviting wildflower, but they are indispensable, beautiful and downright admirable for their impressive defenses. 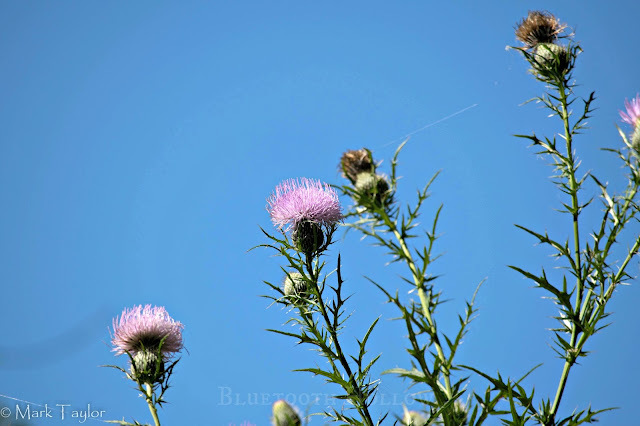 As you step outdoors on these first bright, mild days and take a stroll under the azure autumn sky, give a nod to the Field Thistle, and all of the creatures flocking to it.